Menswear is packed with style rules, most of them historically designed as expressions of class – because only the expensively educated would get to know them. In the 21st century, of course, that means these rules are there to be broken. Take, for example, the double whammy regarding brown shoes: one, that they should only be worn ‘in the country’ – these days an utterly redundant idea; and two, that they should only be worn with navy. No wonder then that pairing a brown shoe with black trousers feels counter-intuitive. Surely it’s all-black? That’s certainly the case with properly formal dressing –black tie or upscale business attire. Beyond that, wearing brown shoes with black trousers can look, at first glance, like a mistake. But no – the brown shoe brings in an element of relaxed informality, toning down the stark, graphic quality of the black trousers. There’s an interesting contrast, especially if you make sure your shoes are a noticeably lighter shade, so think not in terms of dark brown, but of light brown, cognac, camel. And it can all be made to look more of a statement – more like you intended to wear brown shoes with black trousers, rather than did so by accident – by matching or co-ordinating your shoes with another part of your outfit, the likes of your belt or socks, or maybe some detail in a printed shirt. In other words, don’t think of black as being solely for sober dressing, nor as a shade that can’t be mixed with others. Brown shoes with black trousers can be a way to stand out if you know how to do it well. Think of that as a new rule. The black trews, brown shoes combo is most suited to casual dress, since it fundamentally breaks with the dress etiquette more typically expected of formalwear. 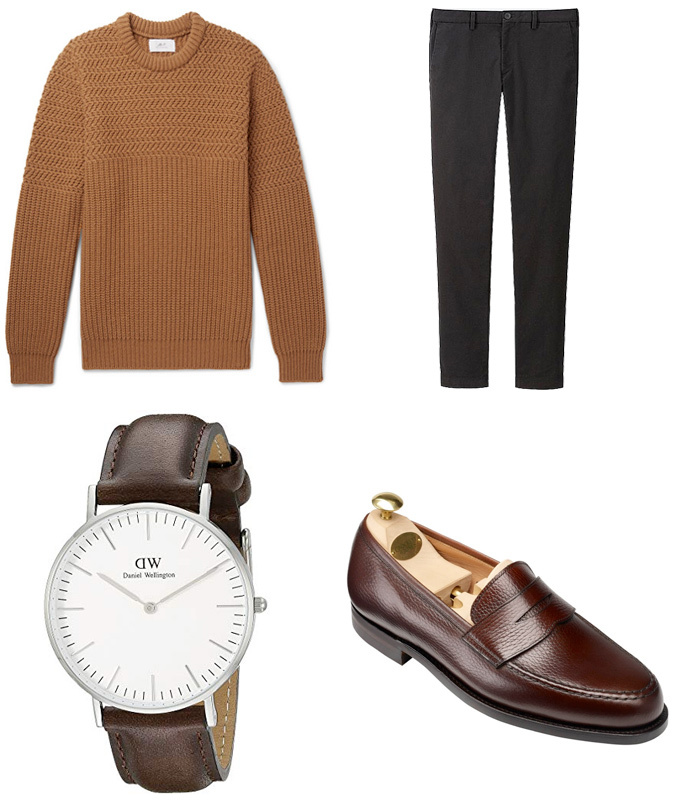 Team a crew neck sweater with black chinos and a brown pair of loafers – a casual style of shoe anyway – and the result is obviously relaxed. But – thanks to the black trousers – it still retains just a touch of smartness that will carry you from, say, a pub to a nice restaurant. To this end, make sure the chinos are not a pair you do the gardening in, but have a crispness to them and fit well. If you’re a big bloke, don’t wear them skinny, as the black will only make them look skinnier still, in turn making your top half look all the bigger. The jumper might be in a complementary tone of brown too. Although black trousers and brown shoes are generally dressed down when worn together, they can still be smart. 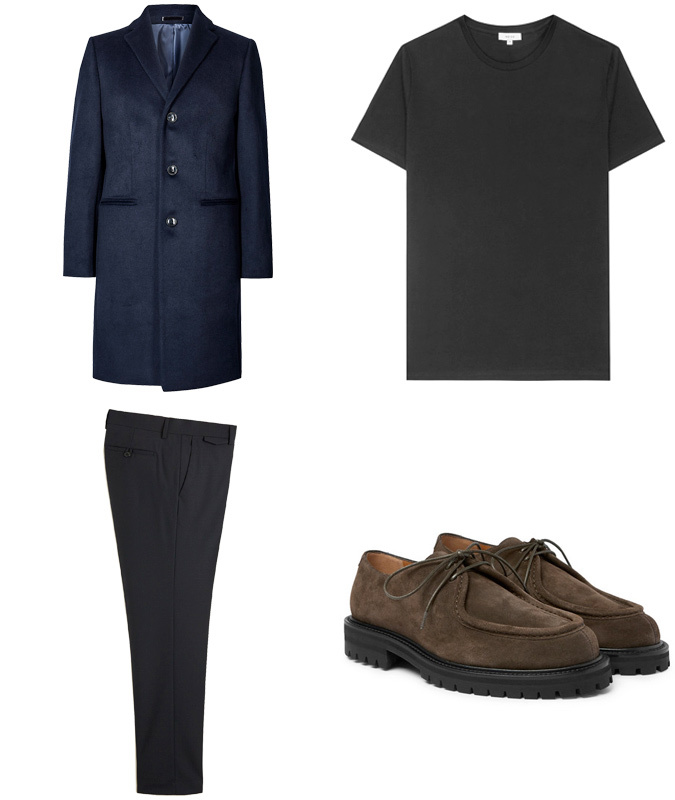 Take, for example, a brown blazer; add black chinos and brown Chelsea boots– you’re sticking with the colour palette in question, but the tailoring and the leaner shape of shoe makes for a more defined silhouette. Since you are working with a largely muted range of colours here, what adds interest is the emphasis on texture, which catches light in different ways to flat surfaces: wear the boots in suede, for instance, and the jacket in perhaps a thin wale corduroy, a velvet or a fabric with a slub to it. Don’t overdo it though: keep the trousers and whatever you wear under the jacket largely texture-free. If you’re wearing a sweater, for example, don’t wear a cable knit. That classic, graphic contrast of black and white – think mod fashion, think Reservoir Dogs – might be thought to leave no room for brown. But perhaps drawing attention to this very fact is what, stylistically, makes it work. Team a black shearling coat with black jeans, add a white shirt, and logic might dictate it’s black boots that finishes the look. Yet try it with a pair of brown ones. By softening the head-to-toe line of monochrome, it not only prevents the overall outfit from becoming too stark but also adds interest by bringing in the unexpected. Expect some not to get it – but trust us, it looks good. When it comes to polishing up for a special occasion, make your black trousers tailored ones – think in terms of a trim fitting pair with perhaps a short turn-up and a couple of pleats in a heavy cotton drill or a textured wool. Either way, be sure to select a style that doesn’t look like the bottom half of a black suit. The shoes to complement, likewise, should be on the more conservative side: a pair of derby shoes are definitely tidy though slightly more laid back than the Oxford style from which they’re derived (the former has an ‘open’ lacing system in which quarters are stitched on top of the vamp). A tailored jacket might be over-doing the dressing up, but a tailored coat in navy hits the right note – again, navy and black are traditionally not worn together, but can look great. Historically black is not a favoured colour in workwear, at least not outside of China. In the west, browns, camels and navies have been the preferences – in large part because they tend to hide the dirt better than black (which actually marks easily). 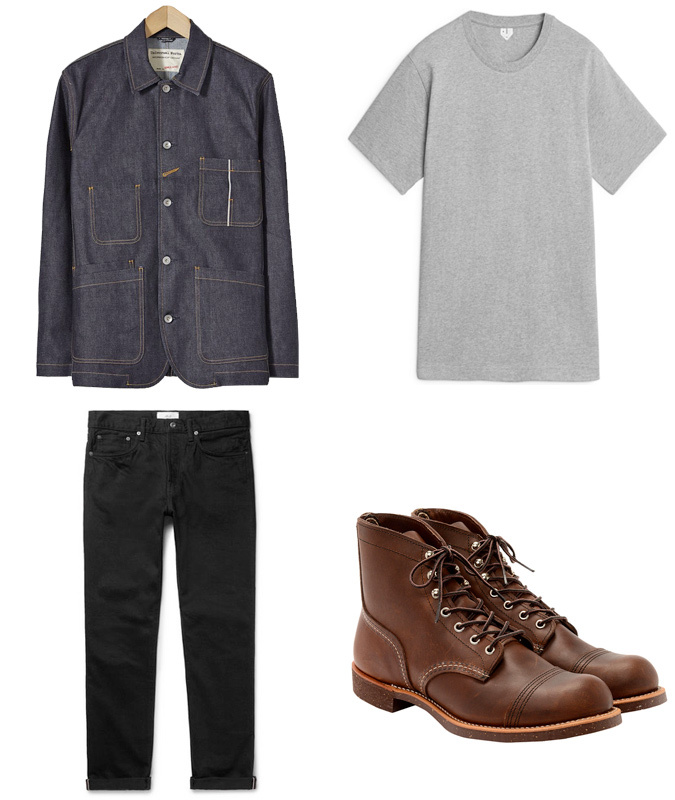 So a pair of black trousers, even ones in denim, consequently offsets more traditional workwear fabrics, the likes of blue denim, while brown boots, of course, are a workwear staple. It’s workwear, given a smarter, more interesting edge. Keep your black jeans properly dark, however, opting perhaps for a pair that have been over-dyed. While blue denim can improve with age, traditional black denim that’s been worn to a fade just tends to look a tricky shade of grey.